to maximize performance, success and profits. ISC Penn Hudson is a leading advisory firm in our industry offering guidance to companies dealing with macro issues and opportunities that impact their businesses. With deep insight, knowledge and experience across the window, door and glass industries, ISC Penn Hudson can help evaluate or develop your plan to identify the best opportunities for growth and profitability using our proprietary platform, Test Drive. We will help you to pinpoint what matters most and give you the necessary tools to make hard decisions when faced with challenging situations. The Test Drive platform is an integrated system of analysis based on years of providing advice in complex and demanding situations. It brings key drivers of a company into focus and integrates them in a user-friendly way that improves performance, enhances decision-making and results in events having a higher probability of success. Test Driving connotes our using the Test Drive platform interactively with management and key stakeholders. Clients can experiment with different ways of running a company, selecting the approaches that might work best and doing so with a higher degree of confidence. This highly flexible, forecast-based system addresses five areas of corporate finance. The system’s modules are structured to focus on relationships between key drivers of performance: growth, margin, investment and return. Individual modules contain certain unique types of inquiry, but the integrated design of the Test Drive platform ensures that all modules are accessible in any specific engagement. All modules point to events. Events are outcomes segregated into Revitalize, Rebalance, Refinance, Redeploy and Reimagine. Depending on the situation, these events have different applications depending on the circumstances. 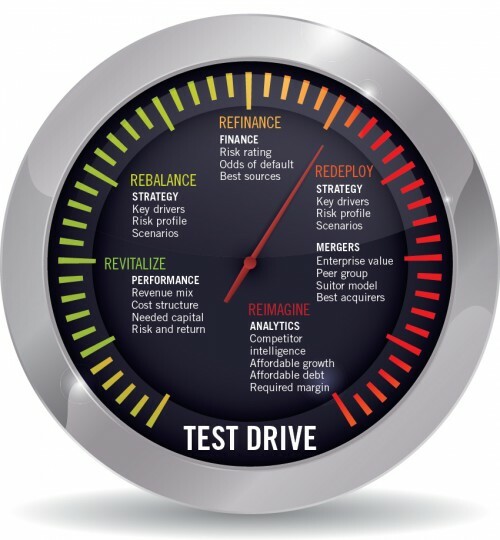 Test Drive is comprised of five modules – Strategy, Performance, Financing, Mergers and Analytics. Strategy focuses on identifying options and choosing amongst them those with a higher likelihood of success. In turn, we use Test Drive to examine key drivers and their effects on value and return, what is the rate of affordable growth, how the risk profile shifts under different scenarios and how these scenarios compare to one another. Performance focuses on companies, business units, or product lines that are stalemated in some way. Our emphasis is on revenue mix, cost structure, needed capital and risk and return characteristics. In turn, we use Test Drive to sort through numerous combinations of potential changes to help determine those factors most likely to quickly revitalize profitability and cash flow on a sustainable basis. Financing focuses on raising senior or junior capital for companies at various stages along the performance spectrum, especially in those situations where difficulties are more prominent. Key to each project is estimating the risk rating from both the perspective of the lender or the investor, determining the odds of default and identifying the best sources for senior or junior capital. In turn, we use Test Drive to evaluate different financing options and structural components likely to influence the creditor or investor approval process. Mergers focuses on acquisitions, divestitures and sales. Most of our clients are closely-held companies, often with choppy histories that can lead to a large gap between value and price, which is where we commit considerable effort in bridging. As part of our approach, we use our Suitor Model to establish what is unique about a client; the model includes how these features will resonate with the strategic interests of particular types of potential acquirers, the width of the gap between value and price, what is needed to narrow this gap, and, if over time, what combination of operating changes are required and at what level of risk. In turn, we use Test Drive to evaluate different strategic and transaction scenarios linked to value and return for the client and the buyer. Analytics focuses on aggregating data from a wide variety of non-traditional, as well as more conventional sources, that we link to Test Drive. A key element of analytics is determining value and return of the product, customer, business unit, division and/or company level, which our clients use to help them make more informed decisions. We develop simulation models to provide management with probabilistic outcomes that are then incorporated into projections to test ranges of expectations and probe critical assumptions that can affect earnings, cash flow and value in both positive and negative ways. Issue: Complications from commercial market decline in aluminum windows results in losses and the bank group demanding changes. Issue: Poor production flow combined with shortfalls to plan caused the bank to freeze the line and demand additional collateral. Issue: Weak cost control and inadequate internal data to determine profitability by product line (vinyl versus aluminum) led the bank to demand new forecasts. Issue: Expansion pressure combined with unrelated subsidiaries draining cash flow led the bank group to demand payment. Issue: Senior family ownership wanted to transfer common shares to the children. Solution: We helped management negotiate a standstill agreement, prune SKUs and related inventory, close certain retail locations and eventually refinance debt with existing banks. Solution: We helped to craft a financing vehicle using a letter of credit from another window company who agreed to support inventory through a purchase option, which in turn encouraged the banks to advance new funds. Solution: We helped management reconfigure the plant floor geared around product data we assembled to eventually exit aluminum windows due to both labor costs and credit risk. Solution: We helped management negotiate a buyout of bank indebtedness and arrange replacement financing. Solution: We helped management prepare a valuation in the connection with subordinated debt to fund the buyout.